Bi-color portrait definitive Cyprus stamps, similar to those first introduced in 1894, continued in use throughout the reign of King Edward VII and through much of the reign of King George V. These small-format portrait definitive stamps would be discontinued in 1928, and they would be permanently replaced by larger-format pictorial definitive and commemorative postage stamps that would better reflect the history and culture of this island nation. Some very large denomination portrait definitive Cyprus stamps were introduced during the reign of King George V, and they were denominated in Pounds Sterling instead of Piasters. These stamps were valid for postage on commercial mail, however they were primarily used as revenue stamps. 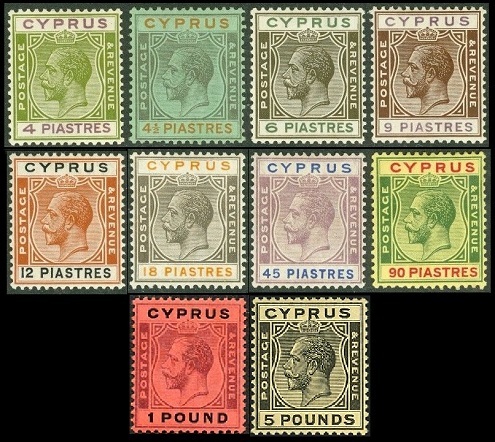 These Cyprus stamps, with postal cancellations are very rare. With revenue cancellations, they are much more common and affordable. The Pound Sterling equivalents, in Piasters, are as follows. 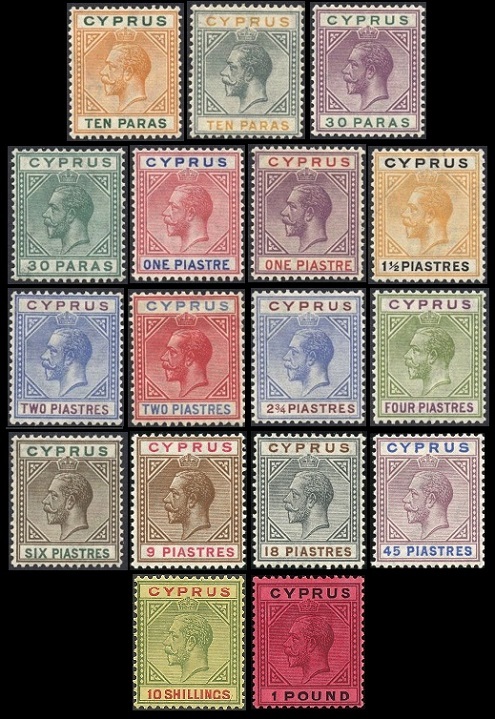 The twelve major-type portrait definitive Cyprus stamps shown above were issued between 1903 and 1907. The common design features the left-facing portrait of King Edward VII. The Scott catalog attributes, for stamps that are watermarked Crown and C A, are as follows. 1/2 Pi. (1903 - Sc. #38) - Green & Rose. 30 Pa. (1903 - Sc. #39) - Violet & Green, Mauve & Green. 01 Pi. (1903 - Sc. #40) - Carmine Rose & Ultramarine. 02 Pi. (1903 - Sc. #41) - Ultramarine & Maroon. 04 Pi. (1903 - Sc. #42) - Olive Green & Violet. 06 Pi. (1903 - Sc. #43) - Olive Brown & Green. 09 Pi. (1903 - Sc. #44) - Brown & Carmine Rose. 12 Pi. (1903 - Sc. #45) - Orange Brown & Black. 18 Pi. (1903 - Sc. #46) - Black & Brown. 45 Pi. (1903 - Sc. #47) - Dark Violet & Ultramarine. The Scott catalog attributes, for stamps that are watermarked Multiple Crown and C A, are as follows. 05 Pa. (1907 - Sc. #48) - Bister & Black. 10 Pa. (1907 - Sc. #49) - Orange & Green. 1/2 Pi. (1904 - Sc. #50) - Green & Carmine Rose. 30 Pa. (1904- Sc. #51) - Reddish Violet & Green. 01 Pi. (1904 - Sc. #52) - Carmine Rose & Ultramarine. 02 Pi. (1904 - Sc. #53) - Ultramarine & Maroon. 04 Pi. (1904 - Sc. #54) - Olive Green & Red Violet. 06 Pi. (1904 - Sc. #55) - Olive Brown & Green. 09 Pi. (1904 - Sc. #56) - Brown & Carmine Rose, Yellow Brown & Carmine Rose. 12 Pi. (1904 - Sc. #57) - Orange Brown & Black. 18 Pi. (1904 - Sc. #58) - Black & Brown. 45 Pi. (1904 - Sc. #59) - Dark Violet & Ultramarine. 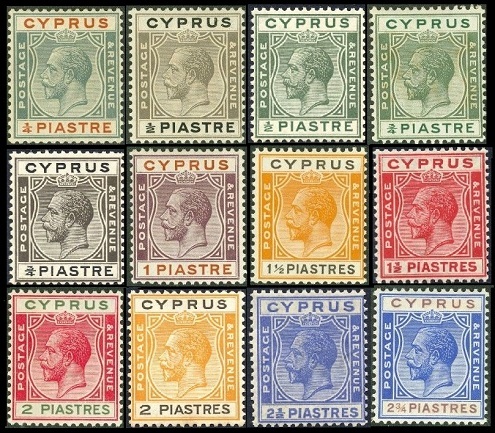 The seventeen major-type portrait definitive Cyprus stamps shown above were issued between 1912 and 1923. The common design features the left-facing portrait of King George V.
10 Pa. (1912 - Sc. #61) - Orange & Green, Orange Yellow & Green. 1/2 Pi. (1912 - Sc. #62) - Green & Carmine Rose, Yellow Green & Carmine. 30 Pa. (1912- Sc. #63) - Violet & Green. 01 Pi. (1912 - Sc. #64) - Carmine & Ultramarine, Carmine & Blue. 02 Pi. (1912 - Sc. #65) - Ultramarine & Maroon. 04 Pi. (1912 - Sc. #66) - Olive Green & Red Violet. 06 Pi. (1912 - Sc. #67) - Olive Brown & Green. 09 Pi. (1912 - Sc. #68) - Brown & Carmine, Yellow Brown & Carmine. 12 Pi. (1912 - Sc. #69) - Orange Brown & Black. 18 Pi. (1912 - Sc. #70) - Black & Brown. 45 Pi. (1912 - Sc. #71) - Dull Violet & Ultramarine. The Scott catalog attributes, for stamps that are watermarked Multiple Crown and Script C A, are as follows. 10 Pa. (1921- Sc. #72)- Orange & Green. 10 Pa. (1923- Sc. #73)- Gray and Yellow. 30 Pa. (1921- Sc. #74) - Violet & Green. 30 Pa. (1923- Sc. #75) - Green. 01 Pi. (1921 - Sc. #76) - Rose & Ultramarine. 01 Pi. (1923 - Sc. #77) - Violet & Carmine. 01 1/2 Pi. (1923 - Sc. #78) - Orange & Black. 02 Pi. (1921 - Sc. #79) - Ultramarine & Red Violet. 02 Pi. (1923 - Sc. #80) - Rose & Ultramarine. 02 3/4 Pi. (1923 - Sc. #81) - Ultramarine & Red Violet. 04 Pi. (1921 - Sc. #82) - Olive Green & Red Violet. 06 Pi. (1921 - Sc. #83) - Olive Brown & Green. 09 Pi. (1921 - Sc. #84) - Brown & Carmine Rose, Yellow Brown & Carmine. 18 Pi. (1921 - Sc. #85) - Black & Brown. 45 Pi. (1912 - Sc. #86) - Dull Violet & Ultramarine. 10 S. (1923 - Sc. #87) - Green & Red on Yellow. £ 1 (1923 - Sc. #88) - Violet & Black on Red. 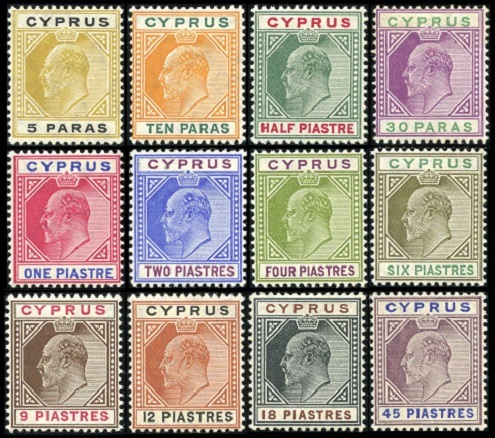 The twenty-two new portrait definitive Cyprus stamps shown above were issued between 1924 and 1928. 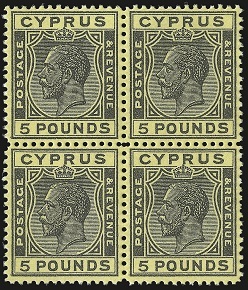 The words "POSTAGE / & REVENUE" have been added to the outside edges of these new Cyprus stamp designs. 1/4 Pi. (1924 - Sc. #89) - Gray & Brown Orange. 1/2 Pi. (1924 - Sc. #90) - Gray Black & Black. 1/2 Pi. (1925 - Sc. #91) - Green & Deep Green. 3/4 Pi. (1924 - Sc. #92) - Green & Deep Green. 3/4 Pi. (1925 - Sc. #93) - Gray Black & Black. 01 Pi. (1924 - Sc. #94) - Brown Violet & Orange Brown. 01 1/2 Pi. (1924 - Sc. #95) - Orange & Black. 01 1/2 Pi. (1925 - Sc. #96) - Carmine. 02 Pi. (1924 - Sc. #97) - Carmine & Green. 02 Pi. (1925 - Sc. #98) - Orange & Black. 02 1/2 Pi. (1925 - Sc. #99) - Ultramarine. 02 3/4 Pi. (1924 - Sc. #100) - Ultramarine & Dull Violet. 04 Pi. (1924 - Sc. #101) - Apple Green & Violet. 04 1/2 Pi. (1924 - Sc. #102) - Black & Yellow on Emerald. 06 Pi. (1924 - Sc. #103) - Green Olive & Green. 09 Pi. (1924 - Sc. #104) - Brown & Dark Violet. 12 Pi. (1924 - Sc. #105) - Orange Brown & Black. 18 Pi. (1924 - Sc. #106) - Black & Orange. 45 Pi. (1924 - Sc. #107) - Gray Violet & Ultramarine. 90 Pi. (1924 - Sc. #108) - Green & Red on Yellow. £ 5 (1928 - Sc. #109) - Black on Yellow. £ 1 (1924 - Sc. #110) - Black and Red on Red.